After playing a Pro-Am with Peyton Manning on Wednesday, Tiger took a commanding three shot lead during the first round at Quail Hollow, shooting 7 under on the day. It looks like the Tiger of old is back, at least for a day. Tiger Woods has more competition, in the wife hotness department. Trevor Immelman impressed on the golf course the entire weekend, beating Tiger Woods by a sizeable margin and winning the Masters for the first time of his career. The viewers were rewarded by seeing yet another attractive wife of a pro golfer. 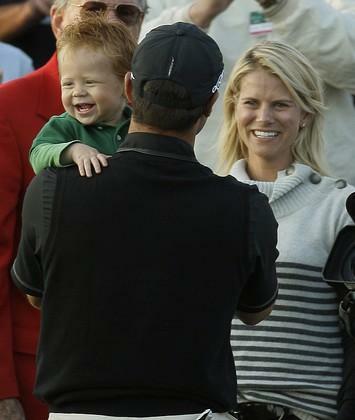 First we had Phil Mickelson’s wife Amy, who is still tops in my book. Then we get Tiger’s wife Elin, who is gorgeous as well. Now we have Carminita. Their son is cool too, with his red hair and humorous facial expression.